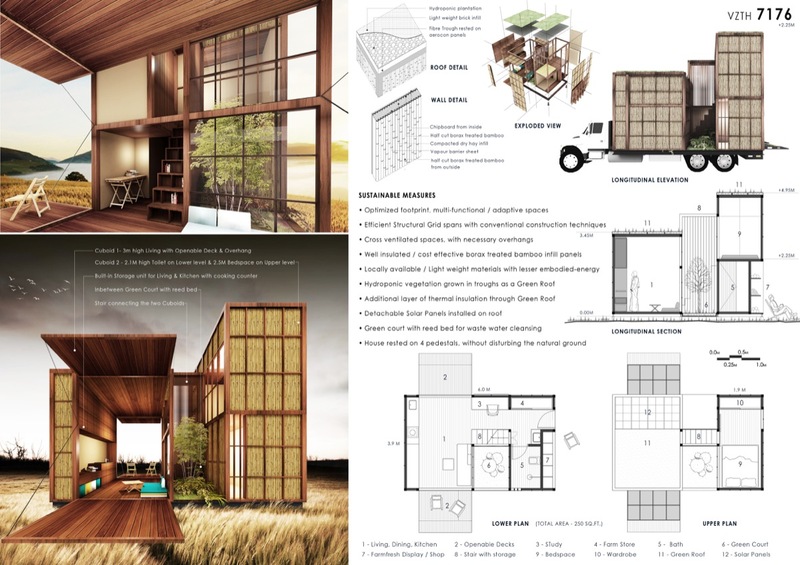 OUR BRIEF – to design an affordable mobile tiny house for a ‘kisaan’, a farmer, from central India, as the Client. The design is based on the idea of Build, Live and Earn, thus promoting a sustainable lifestyle for a farmer. 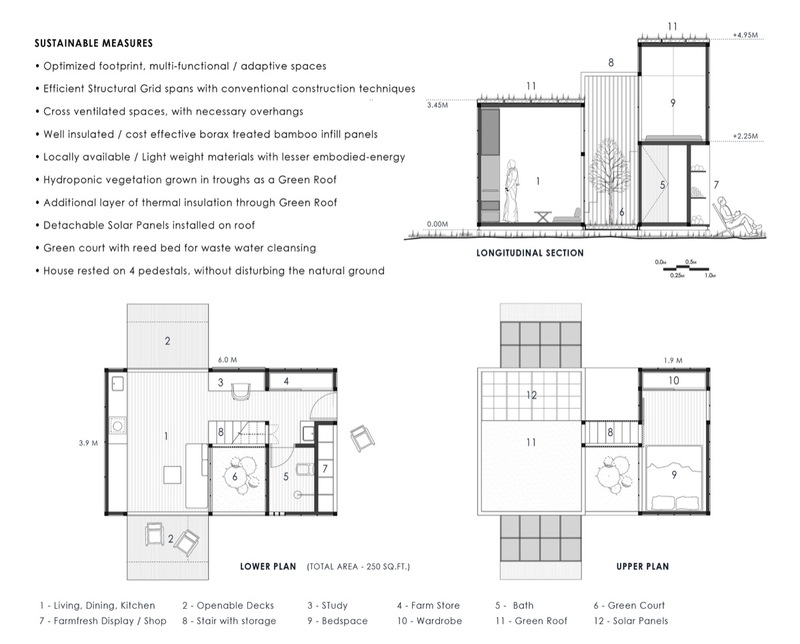 PLANNING – The house is envisaged as two cuboids, one public, one private, separated by a small green court inbetween, while connected by a stair. The 3M high Living+Kitchen cuboid overlooks this court as the immediate view ensuring privacy when needed. 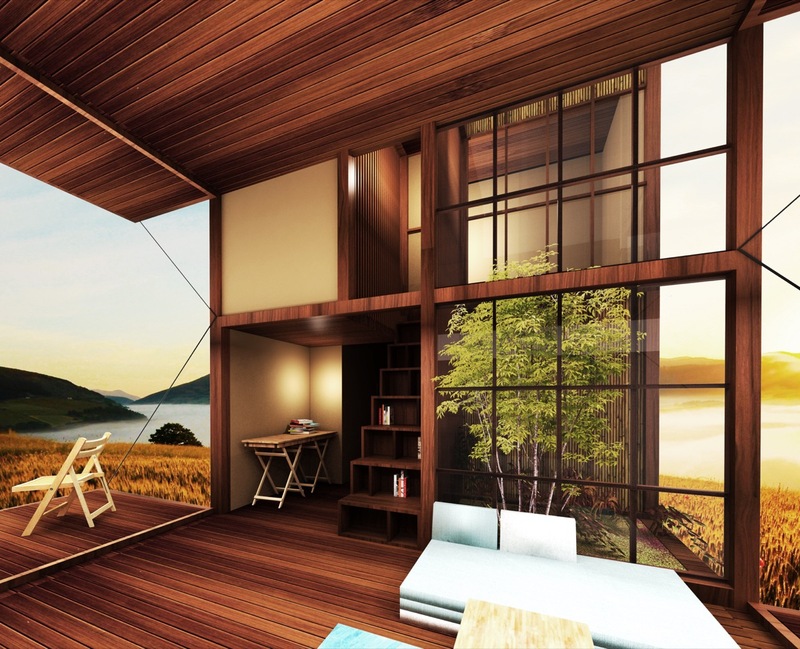 The two shorter sides of the living can drop down to become two cantilevered decks, connecting the inside to the outside, also channelizing the breezes to flow through the house. The second cuboid, 5m high, houses a toilet on lower level, and a bedspace on the upper level. 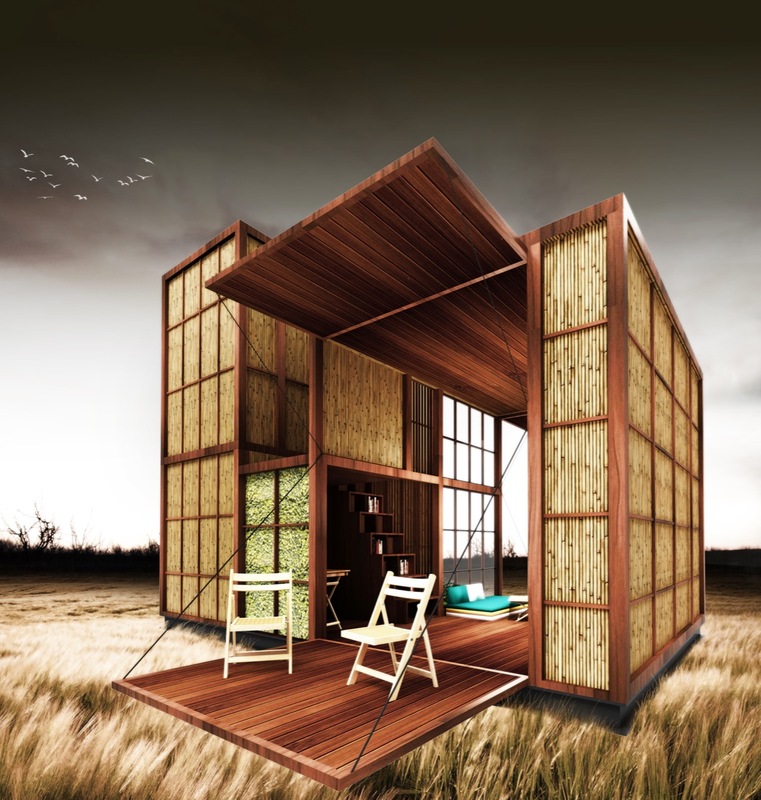 STRATEGY APPLICATION – A kisaan could place this tiny abode anywhere on his farm, work here, rest here. He could also tow the house to a nearby town, to sell his yield directly to the end user, where the house transforms into his shop. He could also transfigure it into a homestay by inviting citydwellers to stay here, establishing a symbiotic relation, where the guests learn / live a countryside farm life while the farmer earns by hosting them. 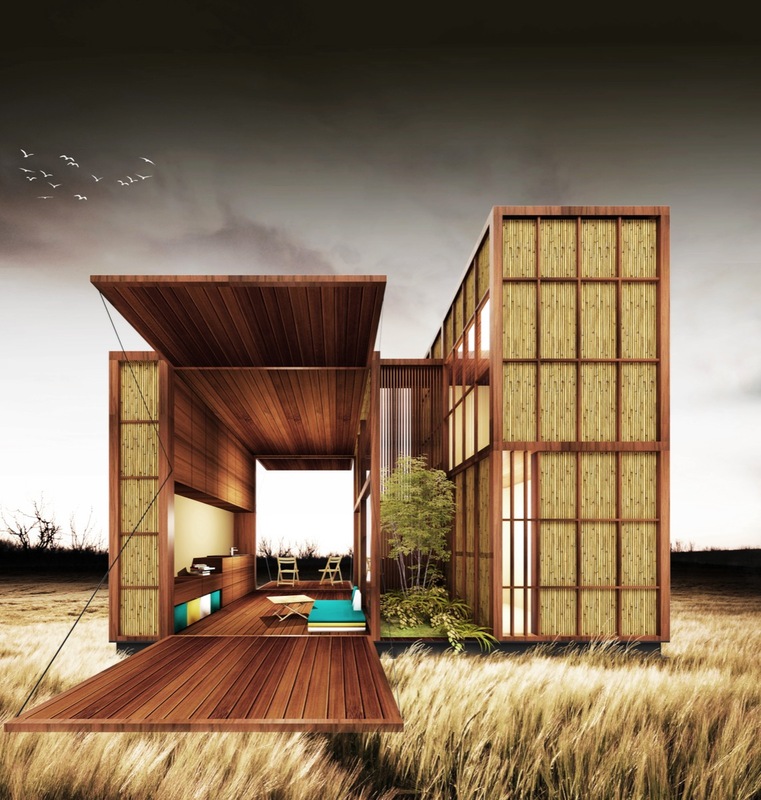 CONSTRUCT – The house is built as a composite of locally available wooden framework with easily replacable bamboo infill panels, resting on a sturdy MS I-frame. The floor and ceiling is made of light weight fibre reinforced cement panels(aerocon), walls internally finished in chipboard. The entire house is envisaged as a Dry Construct, to curb damage during mobility. Modular / foldable seating, beds, tables, chairs ensure space optimization / functional adaptability.